So the past 2 years in January I've published a post about the upcoming books releases I'm looking forward to. You can read the post from earlier this year here. But because a lot more books are announced later in the year there are often more releases that I look forward to so I thought I'd do an updated post about the books coming out later this year. I'm starting with the books mentioned in my original post in January. In it, I hoped that there would be another Robert Galbraith book even though none had been announced. But yay! It was announced a few months ago. Career of Evil is the 3rd Cormoran Strike novel and starts when Robin, Cormoran's assistant, opens a package containing a woman's severed leg. Book is out October 20th. I listed The Hanging Tree by Ben Aaronovitch in my January post but at that time we didn't have a cover. It'll be the 6th book in the Rivers of London series which follows PC Peter Grant. I don't know anything about the plot but I hope it carries on after Broken Homes, book 4, which ended in a massive cliffhanger and wasn't featured much in book 5. Now I originally listed the release date as November 19th and some sites are still listing it as that (including the last update I saw on the publishers website) but Amazon and Waterstones are listing it as June 2016, The last one was pushed back if I remember correctly but I have my fingers crossed for this one! Winter by Marissa Meyer was another book I mentioned without a book cover. It's book 4 in the Lunar Chronicles and will centre around a retelling of Snow White. I've really enjoyed this series and I'll hopefully be doing a buddy read with a friend once it's released which I'm very excited about. Book is out November 10th. I enjoy Alexander McCall Smith's No.1 Ladies' Detective Agency novels. It follows Precious Ramotswe and her agency in Botswana, They are often classified as soft detective novels, they're definitely not hard hitting crimes but more stories centred around the characters. The Woman Who Walked in Sunshine is due out September 17th. I've read all of Rainbow Rowell's books (except Landline, though it's on my to read list) and this is her first fantasy book. In Fangirl, main character Cath would write fanfiction about the Simon Snow wizard series (not so loosely based off Harry Potter) and Carry On is a Simon Snow book! I'm not sure how I feel about it, it's very different to her other books but I will give it a go. Book is out October 8th (as are SO many other books! Major day for book publications). I've read two of Mark Mason's books before (Walk the Lines, about walking all the London Underground lines above ground and Move Along, Please, about a journey from Land's End to John O'Groats on local buses) and really enjoyed them. It seems this book is about interesting facts and stories from all of Britain's postcodes. Out October 15th. I've probably missed a few more, like I mentioned above October 8th is a massive day in book publications, loads of other books will be released around then in time for Christmas. Will any of these be on your Christmas wishlist? Comment below! I was so glad to hear there would be another Galbraith book this year! It took forever to get word of it as well. The Harry Potter book looks so beautiful, I can't wait to have a better look at it! 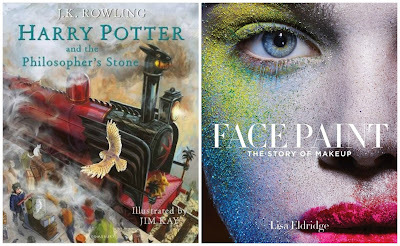 That Harry Potter book looks glorious! And I can not wait for the Lisa Eldridge one, she's the best on YouTube, she really knows her stuff!